Out past Rexburg water tower, follow pole line to the left. Stay right right at the fork in the road. Continue South until 7800 S (The road dead ends here). Turn left. Go about 1.5 miles and turn right. The old townsite is along the creek. This is a really neat little ghost town. The school and store in Herbert were mostly for the farmers and mines in the area. At it's peak, about 150 people lived here. 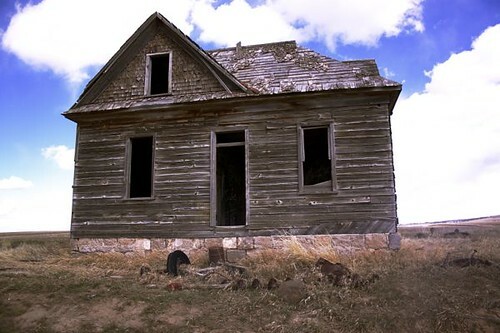 The townsite became abandoned in the 1940's as most residents moved to Rexburg and Rigby. Most of the houses are found along the creek and are not visible from the road. The two room building on the bluff was the store and operated until the early 30's. Automobiles pretty much killed this town because the store and school were no longer needed as Rexburg was close. Not only that, there are very hard winters in this area.